GOTCHA A new machine, shaped sort of like a five-fingered arcade claw, gently encloses soft-bodied sea creatures (like this cephalopod) to study before releasing them, unharmed, back into the ocean. Like a submarine Poké Ball, a new robotic device gently captures and releases deep-sea creatures without a scratch. This critter catcher could be decked out with cameras and other sensors to give scientists an unprecedented view of life in one of Earth’s most mysterious environments. The contraption, designed to be mounted on a remotely operated underwater vehicle, folds into a 12-sided box about 21 centimeters across. Using a joystick, an operator on board a nearby ship can carefully close this box around soft-bodied creatures, like jellies and cephalopods, that might be hurt or killed by other specimen-collection tools. 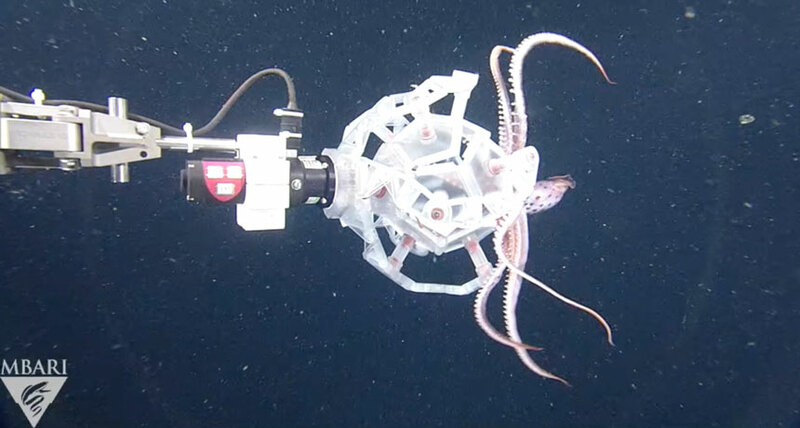 Temporarily detaining creatures inside the enclosure, described online July 18 in Science Robotics, would create rare opportunities for closeup inspection of otherwise elusive deep-sea creatures. Researchers have a few tools in their arsenals for capturing open-water animals and bringing them to the surface for examination. Unfortunately, nets or suction devices well suited for nabbing sturdy deep-sea dwellers, like fish and crustaceans, can shred fragile life-forms like comb jellies and siphonophores (SN: 7/16/05, p. 46). The new creature-catching gadget offers “a really cool” way to handle the deep sea’s most delicate residents more gently, says Kelly Robinson, a biological oceanographer at the University of Louisiana at Lafayette not involved in the work. Zhi Ern Teoh, a mechanical engineer at Cooper Perkins Inc., an engineering firm based in Lexington, Mass., and colleagues tested their device in an underwater canyon in Monterey Bay off the coast of California. The researchers trapped and released jellyfish and squid up to 700 meters below the surface, but their machine is designed to work as deep as 11 kilometers. Encasing animals inside this robotic box “is really the first step among many,” Gruber says. The team now hopes to rig the machine with 3-D cameras, DNA-swabbing technology and other sensors to gather information on specimens’ physiology. The chamber could also be equipped with instruments to tag animals before they’re released back into the ocean. Using this technology to inspect deep-sea life on its home turf would be far less stressful for animals than bringing them up to the surface. At sea level, “you’ve got pressure changes, temperature changes, light changes and people staring at them,” says George Matsumoto, a marine biologist at the Monterey Bay Aquarium Research Institute in Moss Landing, Calif., where Teoh and colleagues tested their device.